Chinchillas live in rocky places in the Andes mountains at altitudes ranging from 3,000 to 16,500 feet. Their habitat used to stretch across Peru, Bolivia, Chile, and Argentina. And as you might imagine, this mountain terrain is barren, full of thorny shrubs, and made up of large rocks with various gaps and crevices. Water is scarce, humidity is low, and it rarely rains so wild chinchillas must rely on morning dew for a drink. Some cacti and the cacti fruit they feed on also provide some water. Their quest for food starts at dusk and continues through to the early morning. When the sun rises, wild chinchillas retreat to their underground dens. These dens are often in and around the cardon plant, but sometimes also in and around rocks. Because of the potentially low temperatures that wild chinchillas must endure, their thick fur is necessary for their survival. Their fur also helps reduces evaporation. As a direct result of excessive exports for the fur trade, the wild chinchilla population has been decimated. 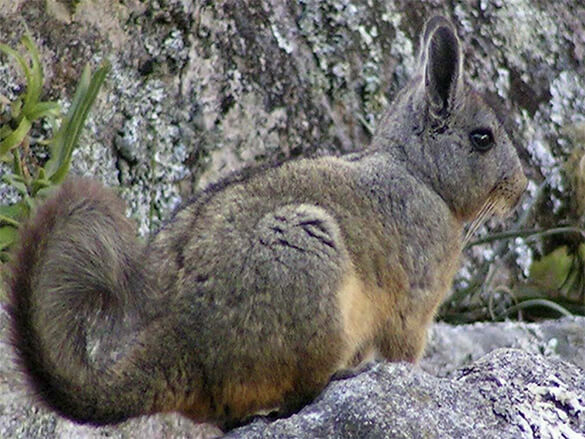 They are now found only in central Chile and they have been marked as an endangered species. Sadly, even though hunting chinchillas and exporting their pelts is illegal, their numbers in the wild continue to decrease. Biologists speculate that this continuing decline is likely due to continued expansion of land use for mining, wood collection, and livestock grazing. Chinchillas must also contend with natural predators such as foxes, eagles, and hawks. I have one myself, and she is a sweet heart. For the people who want one please check the humane society's they do sell them there. Only if they have some. My is standard grey the most common one you can find but who know what color you can find! i have always wanted a chinchila.I am 10 years old. This really helped me on my report for school thanks ! That picture posted of a wild chinchilla is not a chinchilla. It is a viscacha. I am looking for a nice home for my two chinchillas the female is a beige and the male is a gray I love them both but unfortunately cannot afford to keep up with them breeding. If anyone is interested I am in the syracuse NY area. I just love chinchillas i have two and im only 7 my self.This is my story!Iv been looking for a cute loveabel pet for everrrr!My mother sad that this is the last plase wher looking in.Then in the corner of my eye i saw two cute chinchillas!The momint i seen them it struk my that i just fond the right pet for me.I showed mother and i told her about them then she sad yes to both of then!It cast alot but it was worth it.I think my mother only sad yes so id just sutup i realy dont care as long as i get then together.Iv desited to call the male Bob and the female Eve.Eve been geting biger sens then im thinking shes going to have babys soon!! !Thakfully there not related or ther can be some jenes geting coped to the next littel ones.So if yuo have any tips on how to prepar and/or for tacking care of baby chinchillas do speak?Ill try to resurch about it but i can do use some good advise right now. Do not breed chinchillas when you're so young. The breeding process is very difficult especially for a little kid. I recommend leaving the breeding to a responsible adult. The information on your website has been very helpful for my research paper for English class. I too have a Chinchilla of my own, his name is Buzz, though I'm not sure how old he is because he was given away a few times before I got him. Anyway, I'm glad that you have this website about Chinchillas because not alot of people know much about them and it's sad that chinchillas have had to die because of human selfishness. I once had a chinchilla of my own. I'm only 9 years old. I named my chinchilla Hebru. Grace is my mom. Baby chinchillas are so soft that you can hardly feel that they're there! I miss hebru and I'm glad you are telling about chins.